A great shower is an important feature of any modern home. As a shower specialist Plumber On Tap can assist with all your shower problems whether it be a leaking valve or shower head, irregular temperature, running cold, or suffering from a poor flow rate. Whether you have an electric mains fed shower, mixer valve, pumped or an advanced digital shower Plumber On Tap can help. Trained to repair and maintain all the major shower makes including Aqualisa, Bristan, Mira, Matki,Crosswater,Triton, Grohe ,Trevi ,Ideal Standard and Hansgrohe and able to provide a comprehensive replacement parts service to keep your shower or shower pump operating to its full potential. Other common shower plumbing faults that Plumber On Tap can help with include tracing water leaks, leaking shower trays and enclosures, broken wastes, blocked wastes, cracked tiling and missing grout. Many shower cubicles suffer from bad seals around the shower door edges and this can be the cause of escaping water that can damage your flooring and stain lower floor ceilings if not rectified. Silicone seals at the base of the shower cubicle should be in good order and not be cracked or split. If your not sure , call Plumber On Tap for advice. In order for your shower to operate effectively, the valve should be fully compatible with the type of boiler or hot water system that you have. For optimum performance the water supply pipe work to the shower mixer valve should be installed to the correct size and not have too many bends that can restrict the flow rate. All these factors will have an impact on the overall performance of the shower. If you are experiencing problems with your shower, give Plumber On Tap a call today. 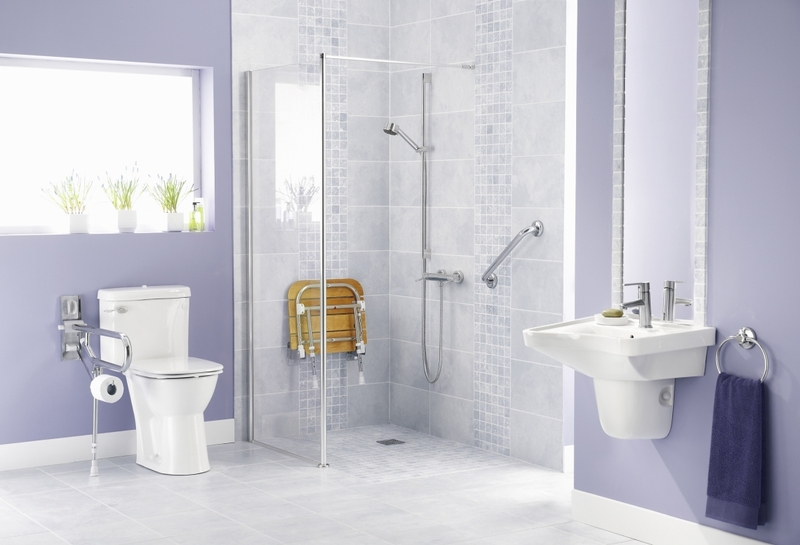 For less mobile customers I can provide a range of low level shower trays, special wide entry shower enclosures and doors, safety rails and shower seats. Please contact me and I will be happy to answer your questions or carry out a site visit to advise you on the range of specialist equipment available. To refit new fitted furniture units with built in toilet cistern and inset wash basin. Refurbish the shower with new shower paneling and shower seat, fit a new shower valve, glass enclosure and new vinyl flooring . The objective was to introduce a new wall finish within the shower area that would compliment the existing bathroom tiling. Adrian came up with a scheme that updated the shower area without the need to re tile the whole bathroom. We are delighted with the final look of the room and happy with the advice that was given. A very good job done by Adrian, changing all the taps in my bathroom. He was punctual and everything was left clean and tidy. We have found that the work carried out for us by Plumber On Tap has always been of a very good standard and the advice given has always been most helpful. When finishing any work the place has been left clean and tidy.